Another trailer for Ooblets! In my post above, I talked a great deal about the great debug camera tools for Ooblets; things only got better this time around! For starters there was a new flycam controlled via keyboard and mouse. This gave me the means to get cool shots that were either not possible in previous builds or simply more difficult to achieve. For example, the first shot is me tracking in with the flycam while simultaneously controlling the character with the controller. This meant I had to use the gamepad thumbsticks to control the character while pressing the up-arrow key on my keyboard with my index finger. This shot was probably possible in previous builds, but was much easier this time around! Since the first trailer only came a few months ago, I wanted the trailer to have its own look and feel. This partially translated into more wide shots; hopefully I was successful in keeping the audience interested even if they’d seen the first trailer. Character customization is the biggest addition to the game since the previous trailer. Now all the Ooblets have accessories, and the player character has customizable skin color, hair style, hair color, and several articles of clothing. Also, the way the character customization is set up, there is never a prompt to choose your gender; you simply choose your hair and clothing! Since there were so many customization options we wanted to feature a diverse cast of playable characters. For music we collaborated with Pedro Silva of Slime Girls. For most of the process I worked with a rough cut Pedro made. The rough track wasn’t dramatically from the end result, but he did add a new section that I used for the dancing montage. The other highlight for the trailer is a new region that’s quite distinctive from the rest of the Ooblets world. Along with the new stuff, it was still important to quickly review the basics of the gameplay of Ooblets just in case it’s first trailer someone sees for the game. Some other new debug toys were a menu accessible via controller, some buttons to quickly turn off all UI elements via the controller, and lots more that helped shave time off my game capturing. For the dance montage scene Becky made a blank world where I could choose random color backgrounds or input hexidecimals to get specific colors. I took full advantage of this new tool by using it for the split screen dance montage. Another very fun trailer to make for Ooblets! Hopefully I succeeded in making it distinctive enough that people still enjoy and share it. The game still doesn’t come out until sometime in 2018, so I can’t even imagine what it’s going to look like by the time it’s released! Another dream project! I love Gone Home (and first person narrative games in general) so as soon as Tacoma was announced I knew I wanted to make a trailer for it. When I heard Fullbright planned on releasing in mid 2017, I emailed Steve Gaynor to see if they needed help with their launch trailer (couldn’t hurt, right?). That’s how I got the gig! Of course, that’s not all it took to get the gig. I previously edited the trailer for Gone Home on console, and I’d talked to Steve multiple times at various trade shows. In fact while at GDC when I was eating by myself at a Vietnamese restaurant, Steve coincidentally got seated next to me during the middle of my meal; we talked a bit before he had to rush off to do some Tacoma promotion. As someone who makes trailers, it’s never lost on me that a lot of the job is just reminding people you exist! Despite all the times we talked I never once assumed that I was a shoo-in to get to work on Tacoma. So I’m glad I sent the email, and everything all worked out! A science fiction game with sign language logins? How could I NOT want to work on this?? Tacoma is now in my top 3 games to capture for! (the others are Quadrilateral Cowboy and Ooblets). While capturing Tacoma I also made a 3X3 grid for my monitor via some blue tape and string. This helped me compose shots using the rule of thirds. I’ll have to come up with a way to quickly set up this grid on my monitor because this is something I’ll definitely use in the future! One of my favorite Twitter accounts is Comp Cam which overlays various line formations to illustrate beautiful shot compositions in film and TV. My makeshift 3x3 grid. I was too lazy to take it off at lunch time; I ended up seeing how "Midnight Diner: Tokyo Stories" used the rule of thirds. This trailer is an expanded version of the teaser that played at the Microsoft E3 Press Conference. Fullbright licensed the music cue "Find Me" by Szjerdene, and made cutdowns of the song for both the teaser and full trailer. The full trailer includes song lyrics, but the teaser just uses instrumental portions of the cue. First thing I did was very rough capture of all the dialogue (excluding spoilery sections). For the first pass I didn’t care about shot composition, because there was no sense putting that time in until I knew what lines I was using. I also marked up the music so I could see the gaps between the lyrics where I could potentially intercut dialogue. 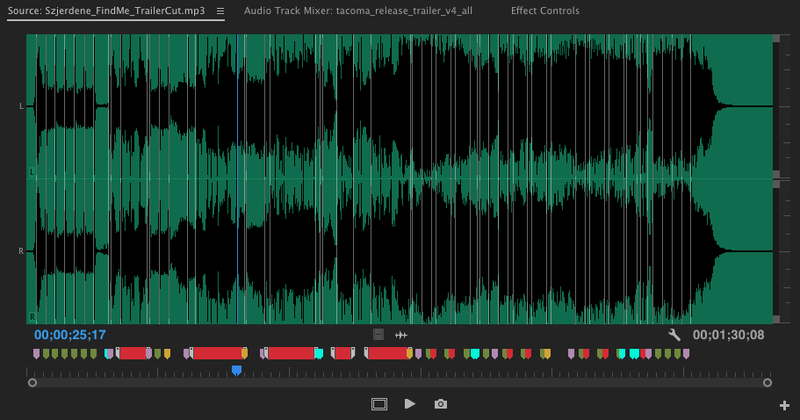 Before editing with a piece of music, I put color coded markers so I can know the structure of it at a glance. Here, the red sections are lyrics. The basic story for the trailer was: accident occurs on the space station, the crew members are worried what’s going to happen. That doesn’t sound like much, but it felt like enough to entice the audience to want to know more. To pare down the dialogue I selected lines that had quick exposition about the situation, and lines that illustrated the stories of the individual characters. In my first rough cut, the accident scene was in a cold open followed by Amy investigating in the station and watching more recordings. I threw that idea out because I decided that 90 seconds of the crew being worried might overstay its welcome. So instead I integrated the accident into the first half of the trailer. The lyrics of the song are very appropriate to the story because it refers to picking up pieces of something to discover what was going on. Trailers aren’t the most subtle artform out there, so I just cut visuals that literally matched those lines. I intercut the dialogue with pretty visuals, a bit of gameplay, and small visual story bits like the low oxygen meter. Everything in the backend of the trailer was cut to support each character’s little story within the trailer. Once I had a dialogue edit for the trailer I went back into the game to find the best angles for each line of dialogue. If it wasn't immediately apparently what angle would look best I simply captured from a few angles that I thought looked good, then tried them out in the cut to see which one fit best. It cannot be overstated how much easier the rewind mechanic made this process and dramatically sped up the creative process. It was fun acting like a digital steadicam operator in the game, and trying my best to get as smooth a camera movement as possible while also making the composition look very pretty! Steve and Karla really liked my first cut, and only had some very minor notes about shuffling up the backend dialogue and swapping in a few lines. Other than that, very little was changed! The song choice for this trailer played no small part in how much fun it was to edit. Great build up, pertinent lyrics, and a beautiful climax. I love cutting in visuals that go well with the feel of the music. Intercutting dialogue between song lyrics isn’t something I get to do often, but it adds a nice extra layer of story. This was a tremendously fun project to work on, and I really love how the trailer came out! It simply cannot be repeated enough how smoothly a project can be when there’s good music to work with. All of that on top of the gorgeous visuals, and the rewind mechanic translated into one of my favorite recent projects! The final trailer for Cosmic Trip; this was my first ever series of trailers for a VR game. In a way, it going through Steam Early Access was a way for me to gradually learn about doing a trailer for a VR game. The first trailer was slow and methodical in order to show exactly what you're doing in the game. At the time VR was still very new (at the writing of this post it arguably still is), so I thought it was important to not abstract the game too much with fast cutting. The second trailer was intended to build upon the first trailer by shortening the "tutorial" part of the trailer, then going a more traditional route of exciting capture and faster cutting. It was important to get a lot of new stuff out of the way as soon as possible for the early access purchasers, but also it's just good to show variety! For the final trailer we had a lot of ground to cover. The game as it existed during the first two trailers was a wave-based survival game where you fight increasingly difficult waves of enemies attacking you. In the final game the primary game is a real time strategy game where there's a MUCH larger map, and enemy bases that you take over. The good news from the get go was I had new music to edit to! The music for the first two trailers was good, but for the final trailer I wanted something bigger, faster, and more exciting. The composer Emeen Zarookian took a first pass on the trailer music, but I thought the mood and tempo wasn't quite right. I wanted to give him as much time to compose as possible, but since I hadn't captured any footage yet, I made a timeline using colored title cards, bits of his first draft, and existing music from the game. The colors behind the title cards were to indicate where I thought the music should shift or change in tempo. On the second try, the track was ready to go! An early timeline with color mattes behind text indicating shot ideas for that particular section. This rough outline was sent to the composer. Another key tool available this time was a 3rd person camera set up by one of Funktronic Labs' programmers Coty Getzelmann. The camera let me get a number of shots impossible to get with the headset, and most importantly helped me make visuals for the story of the trailer. I also had a lot of help from Coty and Kalin setting options that affected the game's economy, where enemies spawned, and other things that made capture much faster. Options in the Default.json file, with some of the changes for trailer capture not indented. The intention of the opening shots was to show the game from the perspective of a traditional real time strategy game, then show the audience "Nope, you actually play it in FIRST PERSON." I'm not 100% sure this comes across; irregardless I think it made for a cool opening shot. Originally I wanted to be doing lots of action upon "landing" but ended up with a more of a "Getting ready for battle" vibe. After the logo there are some establishing shots to show environment variety, and introduce the enemy base. This was meant to show some scope, but also important to show Early Access purchasers that there's more stuff in the game now. Technically the enemy base can appear anywhere on the map, but to communicate visually I put the enemy base in the cave so when the audience sees a dark shot they'd instantly know it's the enemy base (hopefully!). The structures in the enemy base are randomly generated, so I had to reload a number of times before getting a formation I found aesthetically pleasing. These are ostensibly the same shot, but hopefully at this point you understand the cave is where the enemy base is, and the bright area is the player's base. The next section I quickly go over the basic economics of the game which is gems and ectoplasm. Not sure how this reads to a new audience, but at the very least the visuals and sounds are very appealing. I chose not to dwell on it too much in favor of more action. I figured seeing numbers with a + next to it would show that there's an in-game economy. Since the story we're telling in this trailer is more complicated, I decided it was necessary to have some graphics, but I thought it'd be cooler if they could be integrated with the gameplay. It made sense to have the word "CONSTRUCT" literally being constructed the same way the other devices in the game are. These text elements were implemented by Coty into a special build of the game. The field of view for the computer's monitor vs the headset was very different. To get this shot I had to get what felt VERY close to the text, with it relatively high in my view. The process of building fabricators, inserting batteries, inserting disks and bots popping out was intercut with enemies spawning at the base. I didn't want to spend too much time away from the enemy base for fear the audience would lose that thread of the trailer. The word "DEPLOY" then pops out just before showing how the player deploys bots by throwing them around, then we see enemies encroaching on the base so that the audience hopefully understands that enemies constantly attack you. Next up is the section about "CONTROL" which shows the game's map for the first time. This was one of the first moments we came up with, showing a familiar mechanic of selecting units on a map and sending them somewhere, but then being able to look up to see those very units flying out in first person view! I also added a quick first person whip-pan of the bots flying because it just looked cool. On the way to the base there's a shot which showcases some new architecture in the game as they pass the word "CONQUER." The map is one of many big new mechanics in the full version! Finally things get really heated as the bots invade the enemy base, and we switch to some first person chaos as the player is fighting the base. This is probably not the best strategy in the game, but it looks pretty cool. Late in the process almost all the cave shots had to be recaptured because in the game some art elements are only rendered when the player camera is present (in order to save memory). Since I was using a 3rd person camera a lot of the time, those effects weren't present, so I had to move the player headset camera to the cave, and then switch to the 3rd person camera to see everything as it should be. One of the many cool 3rd person shots I captured for the trailer. This shot involved a lot of moving units on the map with the headset on, then quickly removing it to pick up a controller to get the shot on my monitor. With the basic story of the game loop established I go into full montage mode showing different items like bombs, the bubble gun, shield knockback, and an environment in a waterfall area. One thing we wanted to address was the variety of colors now in the game because of environments and morning/day/night time periods. To avoid visual confusion I decided the bulk of the trailer should simply be outdoors and in the cave, but for the montage I thought it was fine to throw in the waterfall environment since continuity was no longer a concern (plus it's very pretty!) Some combos were special requests like shield knockback, catching enemy bullets, melee saw attacks, and decorations for the friend bot ^_^ The other shots in the montage were just moments or mechanics I thought were cool, and communicated quickly. This shot was originally just waving to the friend bot in the desert, but I accommodated two separate notes by waving, throwing on sunglasses, and capturing it in the waterfall environment! Finally came the question of how to refer to the game now that it was out of Early Access. Should we just say "Cosmic Trip" ? Should we put a 1.0 after the title? My first idea was to have the Cosmic Trip logo with "Early Access" underneath that I would then destroy with a frisbee. Coty came up with the idea of replacing "Early Access" with 1.0, but visually the 1.0 next to the logo didn't work well. So he came up with the alternative "COMPLETE" which I think worked great! I have a paranoid fear that people will instantly turn off the trailer once they see "Early Access" but I tried to get the frisbee up as soon as possible so they'll see it get destroyed. An elegant solution that solved multiple problems. I would've never thought to ask if another word could pop up once the "Early Access" was destroyed. Collaboration is great! Phew! I'm really happy with how this trailer came out! I've said many times before that good music makes the entire process a joy to work on. Good music plus good material is pretty much the most a trailer editor can hope for. Special thanks to the Funktronic Labs team for the opportunity to work on their juicy as hell VR game. Seriously, the game is just smooth, polished and juicy as all heck, which made it tremendously fun to work on. I hope a lot of other VR games steal the great ideas in Cosmic Trip! This is a very fast Premiere Pro technique for removing audio pops on dialogue jump cuts. The Wild Eternal is a first person exploration game where you play an old woman who is exploring a foggy land in her quest to escape the cycle of rebirth/reincarnation. You interact with a demi-god fox, and as you play the game you learn more about your own story and the fox's. I got this gig via referral from Josh Cauller! The game was primarily developed by brothers Scott Goodrow and Casey Goodrow over the course of several years. When I started the project they had a lot of questions about the direction for the trailer. Atypical of games in the narrative exploration genre, The Wild Eternal has a "skill tree" where the player gains new abilities like: more stamina, the ability to jump further, ability to slide down cliffs etc. A lot of early conversations were about whether or not to highlight these mechanics, but after playing a bit of the game I decided it wouldn't be the correct approach. The reason for this is that the audience looking for a good story aren't likely to be playing for unique game mechanics, and people looking for unique game mechanics won't feel challenged by what mechanics are there. tl;dr is to know your audience. The first person exploration genre is something a lot of people are experimenting with, but past successes have shown that there are people interested in these games despite a vocal minority decrying them as not being "real games." That said, it's still important to find what is unique about the game in order for it to stand out from the crowd. The Wild Eternal's art style first and foremost is beautiful and striking, but the story is what the audience is going to be looking for. This shot was to show off not just the beautiful design, but show variety! After playing through a lot of the game to see the unique environments, items and mechanics, I went through a text document that contained all the dialogue in the game. There's a lot of dialogue that contains stories about the player, the fox, the world of the game and more. But most of the dialogue was focused on too small a part of the game for the trailer, so I looked for dialogue that focused on grand themes, the player's overarching story, the player's perspective on their life, and some big philosophical ideas the fox talks to the player about. The script from these selected dialogues became the backbone of the trailer, and the rest of the focus was on good capture, and showing the variety in the games. Just because the mechanics weren't the primary focus didn't mean we didn't use them at all, so they became the "action" bits between the dialogues to keep the pacing interesting. The rest of the trailer I tried to build up the "intensity" of game mechanics while the music builds and crescendos. For example, the Fox appearing is very simple, walking with the compass is more mechanical, animals show variety and scope, compass activating something is very "game-y", and same with the tears opening the gate. At 1:18 is one of my favorite parts as the music crescendos and the candles light up. I captured a version early on which had fewer candles, but they liked it so much that Scott went in to add more candles, and made a custom build that let me set the proximity at which the candles would turn on. This let me get the perfect shot with candles activating at precisely the right moment. One final behind the scenes thing is the randomly generated dialogue. The game uses a system to procedurally generate spoken gibberish dialogue based on samples from the voice actors. For the trailer I captured as much of this random dialogue as I could so that I could "match" the emotion and intonation of each line so that they fit the text on the screen. Pace is a very subjective thing, but this project let me explore how to keep it up for what is essentially a very slow and meditative trailer/game. Hopefully I succeeded in keeping the audience's attention, and people check out the game! For this trailer I had the least amount of direction, but Ron really wanted the trailer to pose questions that left the audience wanting to play the game to find out the answers. Since all the voice over was recorded, I knew it was my opportunity to do my take-a-ton-of-dialogue-and-make-a-trailer approach. Ron sent me a text document with all the dialogue in the game. It was A LOT. According to Microsoft Word, it was over 10,000 lines of dialogue. Some of it was redundant, but it was still A LOT. First thing I did was skim through looking for broad stroke plot points, and exposition about the town, the story, and characters. In a trailer it's usually better to focus on the big picture, and a lot of dialogue was for very specific moments that require more context. But for example, an NPC saying something like "This is a small town..." is perfect for trailers. It took me a few days, but I whittled it down and separated the dialogue into text documents where I sorted by different categories. For example one had sections like: Exposition - Thimbleweed Park, Exposition - The Body, Generic phrases etc. Look at the file sizes to get an idea of how much work it took to distill the dialogue down. From this sorted dialogue I did a paper edit that covered the broad strokes of the story that went from a cold open to get attention, to exposition about the town, exposition about each character, and then some grand sounding statements from each to sum the whole thing up. I sent that draft to Ron, and he worked on some additions with the rest of the team to flesh out some story bits, and insert some gags and in-jokes. He also wanted to have title cards for each character. Title cards are nice for trailer editing because they give you things to cut to/with. For example, a simple way to get attention or add "flair" is to cut title cards on the hard beats of the music. This was also my first opportunity to do some design work after taking School of Motion's Design Bootcamp class. The title cards ended up being rather simple, but It felt good to have a process to go through in order to get to those final designs. I started by making a Pinterest board of inspiration. I definitely wanted a noir look, it was just a matter of which look to go with. I did some sketches based on the board, and ended up with a character, text next to them and a diagonal highlight emphasized by the rotation of the text and some fake venetian blind highlights on the characters. I also added some grain for texture. My original plan was to make multiple versions to present, but what ended up happening instead was by the time I reached the final version, I thought all my previous ones were utter crap so I just threw them away. Some of the iterations I went through before arriving at the final design of the titles. At one point I thought of giving each character a "title." The difficult part for the editing was figuring out the music. I didn't mind reusing music from old trailers, but this trailer was shaping up to be at least 2 minutes long which is already long by game trailer standards. What I ended up doing was using a very slow and moody track for the beginning so by contrast the middle section would have more energy, and then the end montage is where it really kicks in. Once the character cards start, I'm using the music from the Town area of the game which had several iterations that worked nicely to demarcate each section. I also inserted small action moments here and there to break up the dialogue. This extended the length to just over 2.5 minutes. Hopefully the audience is engrossed enough in the story that they keep watching. I also finished the end off with some film noir trailer-style inspired graphics. I'm very pleased with how this trailer came out, and also all the work I got to do on the previous trailers! I got this gig through via a referral from some developer friends of White Paper Games (I forgot to ask who it was). I got excited when I received this email because I was familiar with their previous game Ether One, and I'm a fan of first person narrative games in general. This was their newest unannounced game. They sent me a trailer draft they were 80% satisfied with, and wanted to see what I could do to improve upon it. I took a look at what they had, and immediately saw some issues that need to be addressed by essentially throwing almost all of it away, and coming up with a totally new structure. In the game you're a journalist who is in a government building right after an act has been passed which is very similar to The Patriot Act in the United States. There's also been a terrorist attack recently on the building, and it's up to you to investigate and report the story. If that wasn't unique enough already, the game is realtime over the course of four hours. The only other game I can think of that does this is Jordan Mechner's The Last Express. That setup means that there are certain events and actions NPCs take in the game that happen at specific times, so if you're not there to see them then you don't see them at all. The first draft of the trailer was centered around an argument between the characters Scarlet and Charles. The problems were that many parts of the conversation were meaningless without greater context, so they muddied up the narrative. I rewrote the trailer using a mix of existing dialogue, scratch voiceover bits, and some background about the game's story. The simpler narrative boiled down to: Terrorist attack, Scarlet is being accused, immigrants are being blamed for bad things in the country, the government might be untrustworthy, player needs to investigate, and Charles is going do something, but what?? From this structure we concentrated on what gameplay moments to highlight. Some key things were: sneaking/investigating, the player's realtime watch, hacking into computers, pneumatic tubes, NPCs using sign language, and more investigating. I made some rough cuts using capture from an early build of the game. The last thing I sent off was an edit with text overlays to indicate the shot types that should appear in those moments. For logistical reasons I couldn't do the final capture or edit, because it very much came down to the wire before the debut. Also an 8 hour time zone difference made turnarounds more difficult. All that said, I still feel a sense of ownership over the trailer, and I'm pleased with how it turned out! I got this gig via Chris Dwyer with whom I worked on the console version of Gone Home, and A Boy and His Blob. Ooblets is an indie game being made by Rebecca Cordingly and Benjamin Wasser. I already followed Becky on Twitter because I saw the ADORABLE gifs she frequently posts for Ooblets, and at some point she followed me back (or was it the other way around?). We talked in November 2016 about me possibly working on a trailer for the game, but for reasons out of their control, they weren't sure when they needed the trailer by until about... a week before they needed it. With a time frame like that we had to get the ball rolling right away! Good thing we were working with composer Calum Bowen who had some music ideas already. He quickly iterated on some ideas with Becky to hone in on the right sound. After he had a couple tracks, we did some back and forth where I would cut the music together according to how long I thought each section should be, then he would either change it to accommodate my edits, or let me know which edits would be too difficult to accommodate. Once we had the sections figured out, he went to work on fleshing out the instrumentation while I got to editing. Because of the bountiful wealth of Ooblets gifs, I was able to use those in my sequence as an animatic to get my basic concept across so I could get the OK from Becky and Ben, and then do the high quality capture. Some very basic ideas like: when to show farming, when to show ooblets, how many ooblets, when to show NPCs etc. That went pretty quickly, and then it was time to capture! This year I went to my first ever GDC, and I feel like I spent most of my time there gushing to other devs about the debug tools I had for Ooblets. Becky added in some great features that made the capture process smooth as butter. The best features by FAR were that I was able to offset the camera either by zooming, panning, rotating etc. but have it still be attached to the player! This meant I could do "steadicam" shots from any angle. Also there was an option to detach the camera from the player, so I could move her independently while the camera stayed static. There was also a toggle for camera speed, and lots of tools for managing ooblets. Becky quickly updated the build for me as I came up with new requests. All in all, it was the best capture experience I've had next to Quadrilateral Cowboy. The in-game camera is never at this zoom/height, but with the offset camera it was dirt simple to do! For the structure of the trailer it was important for me that we get the "cool" part as soon as possible. Kind of like how James Bond and Peter Jackson films have an action packed cold open. Same idea applied here, except for cute stuff! This meant showing Ooblets, and plants growing before showing the farming which is less visually interesting. In film, there's the idea of a "line of rising action", but for trailers I think it's good to have a line that starts high, then comes back down, and then rises from there. Especially in this day and age, we can't afford to not grab attention as soon as possible! So the trailer goes from a quick intro, to plants growing, ooblets, and then back to the "how" part of the trailer which eventually ends in a TON of Ooblets. Then of course dancing for the grand finale, because the dancing in the game is some of the best/cutest I've seen in any game. I also really like the denoument, because it's a nice way to bookend the trailer. It wasn't my intention, but the trailer functions rather like an example of what might happen in one day of playing Ooblets. Overall, one of my favorite game trailer making experiences so far, and the reaction to it made it all the better! Another Thimbleweed Park trailer! This one was another pretty quick turnaround. Ron had written the script, but otherwise had no direction for me. This one was fun because I got to use some different music, and really shape some discreet sections for the trailer. While every good trailer does have some sort of beginning, middle, and end, I don't always feel like I'm editing a story trailer. It's an arbitrary distinction, but I feel much more like I'm editing a trailer when I get to play with the timing via stop downs, rises and transitions. I got to do a lot of that for this trailer, so I had a lot of fun! As with the previous trailers, Ron did all the final capture. This trailer was the first to have on-screen lip sync, which from what I understand involved some new code that was added to the game. While I did end up reusing a lot of music from previous trailers, the circus music, and montage sequence gave some nice energy. Fun fact: before I had the official *beeps* for Ransome's cursing I used the beeps from the swearing telekinetic character from the LucasArts game "Sam & Max Hit the Road." I knew almost no one would ever see that version, but it was just a little fun thing I did while I was working. Another bonus to this trailer was that when the game composer saw my music edit, he said he thought it was good enough that he didn't have to do any work on it. Whoo! At this point I've already made a number of trailers for Pit People, but this was the first big launch of the game. This was a somewhat difficult project because of some big creative decisions that were out of my control. Initially we were making this trailer using some old narration that Stamper found in his archives. It wasn't explicitly to describe the game, but it allowed for some tenuous visual connections that worked well enough simply because of Stamper's amazing execution. For most of the process I was using the music track for the character Sofia, which is a Spanish guitar cue with a lot of energy, and a nice arc to it. My thinking was that by virtue of the Sofia track being so different, it would expand the breadth of the game. It was decided that track was too different from music used in previous trailers, so we changed it to something more quirky. Then late in the process we realized the narration was so old that Stamper's voice for the narrator had changed enough that it wouldn't match the game. This meant the narration I was cutting around had to be removed entirely. Without the narration I had to recut the entire trailer so that music and sound effects were front and center. For the graphics I really wanted them to look like they fit into the universe more. In retrospect I wasn't happy with the scroll graphics I made for the previous trailer because of how flat they looked. This time Dan Paladin was able to hand letter the words. I added some bouncy animation, and combined them with hexes from the in-game UI. I think these titles have much more personality, and I'm pretty pleased with how they came out. A peek behind the scenes at the trailers I edited in 2017! Without access to split audio stems, this is the next best solution to get clean dialogue from movies and video games! A peek behind the scenes at a number of the trailers I edited in 2016. Two stories about the events that lead up to me getting two of my favorite gigs. Nothing I did that got me these gigs were done for the sake of getting hired, and yet it worked out that way in the end. This technique is very useful for multiple scenarios, whether you want a music cue to "ring out" whenever you'd like, or to add reverb to a sound effect. This tutorial is for all major editing platforms! Cosmic Trip was my first ever VR game to make a trailer for, which meant that I learned A LOT in the process. Here is what it was like making this first trailer, and all the tips I took away from it! My list of most frequently used keyboard shortcuts and techniques.